Tapped holes are made in sheet metal parts by first starting with a laser cut hole. 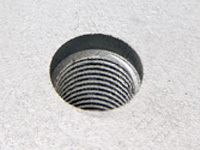 That hole is then treated with a treading bit to create threads in the hole for use with a screw or bolt with matching threads to hold a component or attaching the sheet metal part to another component. There are a number of specifications you have to keep in mind when considering tapped holes. In the American system, a screw thread is designated by two numbers called the screw size and the pitch. For instance, #4-40, #8-32, 1/4-20. The first number refers to the size (and therefore strength) of the screw shaft; the second to the pitch (number of threads per inch) on the screw. So a #4-40 screw has 40 threads per inch, a 1/4-20 has 20 threads per inch. A #4 screw is a smaller diameter (and therefore weaker) than a #6. Common sizes for threaded screws are 4, 6, 8, 10, ¼”, 5/16” and 3/8”. For each shaft size, there are only 2 common usage thread numbers. For example, #8-24 & #8-32 are the common sizes for #8 screws. The two pitches for any size are often referred to as "fine" and "coarse". The fine thread will need more turns to tighten up but will hold more securely in the face of vibration and other factors. The coarse one will be faster to attach but will not hold as securely. The pitch is the number of turns per inch. So, if you have a #4-40 screw in 0.055” material, there will be 2.2 turns or threads (40 turns per inch times 0.055 inches). As a rule of thumb, you need 2 to 2.5 turns to hold well. Depending on your application, the strength of the materials involved, the amount of vibration the part will be subjected to in use, whether a lockwashers is used, and numerous other factors will determine if 2.2 turns may or may not be adequate. It might be wise to try some destructive testing before the final tapped hole design is considered complete. If you determine that the material thickness for the Tapped Hole does not allow enough turns you may want to consider using an Insertion Nut. This is what amounts to a nut that is actually pressed into the material with knurled ends so that it is forced into the sheet metal or other material.